The present intervention is aimed at reconnecting those threads historically broken by the intervention of modernism first and, subsequently, by the definitive cultural deconstruction conducted by postmodernism. It is therefore good, first of all, to conduct a rapid re-examination of the historical-artistic events that have taken place within the contemporary world. As already mentioned, the eighteenth-century body is indelibly marked by the intervention of the Enlightenment, which, through a rationalistic-scientific approach, turns culture in a direction of social emancipation: the birth of archaeological and ethnographic disciplines, the establishment of museums, the spread of school education and new forms of journalism information, the encyclopedia and so on, testify to the concrete and real belief of turning culture to an instrument of that emancipation, first of all leading the culture itself to the bottom. A culture, which precisely through the institution of those new disciplines, focuses its attention on phenomena never considered before: the ethnographic analysis of uses and customs of different cultures is, at the same time, a critical approach to the primacy of Western culture; the same applies to the analysis of ancient civilizations conducted by archaeology, as well as a need to rediscover the cultural roots that will permeate the whole of the nineteenth century and Romanticism in particular. It was this body of thought that led to the development of the socialist current and attention to truth in painting during the nineteenth century. It is certainly not by chance that the exponents of those new pictorial researches, in France as in Italy, adhered to the same socialism, determining a coincidence between life and research. It is not by chance that Romanticism felt the need to emancipate the arts first of all from equivocal commissions, which would otherwise invalidate their research. Therefore, even within the pictorial representation, the subjects are more and more turned downwards: peasants, workers, laborers, factories, city life, poverty; in a perfect coincidence between cultural research, ideological development and a pictorial approach that fragments the material, speeding up the execution of the work to better grasp the moments of real life, urban or rural, and assigning to the pictorial object more and more a semblance of study rather than definitive, coinciding more and more with the identity of those moments of life lived. An example of this are the so-called Macchiaioli in Italy and in France, as its greatest representative, Courbet and then the Impressionists, who took up the use of the material again courbet premises pushing it even further, with the intention of representing those everyday city especially from the point of view of lighting and, even after, the painting of Van Gogh, Munch and Ensor. But to these premises, during the historical-artistic development of the 19th century, two other phenomena were soon added, which substantially interrupted and watered down, so to speak, the race to the bass. On the one hand, there is the intervention of modernism which, depending on the geographical areas, takes on different names: Art Nouveau, Modern Style, Jugenstil, Liberty. Certainly the modernist intent was enlightened and aimed at the continuation of emancipation. «Modernism, in its progressive momentum, believed in the utopian ideal of bringing ‘beauty’ to every aspect of everyday life at the level of all social strata, using new materials and construction techniques in architecture, and mass production for furnishing objects. The art-industry alliance became a watchword and in fact Modernism flourished in areas of advanced industrialization. […] The clientele of the buildings […] makes it possible to identify in the entrepreneurial upper middle class the class that gave its support to Modernism, in the search for a new cultural identity that symbolized and ennobled its rise to economic power […] It is no coincidence that Liberty has long been considered the style of cottages and large hotels or, on the contrary, of tombs and cemeteries: places and buildings, that is, which symbolically expressed and welcomed the glories and social rites of the bourgeoisie» (Bairati Eleonora – Finocchi Anna, Arte in Italia, volume 3, , Turin, Loescher Editore, 1991). And so, contrary to its premises, Modernism ended up bringing art back within the schematism of the client, this time represented by the upper middle class. It also led, for the same reasons, to a decorativism that well suited the needs of the new ruling class. Think of the best-known examples of this movement, certainly identifiable in the Vienna area of the Jugenstil and in particular in Klimt’s work, which combines the new decorative requirements with figurative reminiscences of a classical matrix. Modernism increasingly turned the artistic language towards stylization, both to obtain the decorativism it needed and to move it away from the truth of the bottom. This is also the reason why its best results are found in the applied arts: architecture, furniture, graphics, illustration, etc.. The Italian illustrative-publishing tradition within this culture was formed, determining and marking the subsequent developments. It must also be said that the modernist will to design required total control of all aspects, from the building, to furniture, to objects, a hegemony of total control typical of industrial and capitalist processes and that later, following the advent of totalitarianism (Nazism and Fascism), would even affect the breed. The other intervention that interrupts the race to the bass is Symbolism, which combines superficial classic-academic ancestry to decadent literary attitudes unrealistic, a phenomenon that in Italy will have its greatest literary promulgator in D’Annunzio and, internationally, a pictorial matrix in the “pre-Raphaelite brotherhood”, although we can trace idealistic precedents in the group of Nazzarene. These two phenomena (pictorial-literary), deeply interconnected by cultural exchanges and references, determine a shift of culture towards a snobbish and elitist drift, nourished mainly by the shared contempt for the middle class, but of which, this time too, they will end up doing the interests. It will be, in fact, precisely these attitudes that will push more and more in an extremist direction, to the point of facilitating the introduction and spread of totalitarian and racist ideologies. Even Symbolism, therefore, although pursuing historical-idealist aspirations, ends up turning to be a utilitarian tool of the new ruling classes and, in its pursuit of ideism, escapes from the daily truth of the “low”; but instead of resorting to decorative stylization, it resorts to the courtly and polished language of the academy. A courtly language which, later on, would become the official voice of the totalitarian regimes in their monumental expressive will. If, on the one hand, modernist stylizations will lead to a series of linguistic positions that later became typical of the historical avant-gardes, on the other hand, courtly academicism will lead to positions that were first metaphysical and then realistic-magic. Post-modernism seems to follow these events: on the one hand, through transavantgarde and neo-expressionist attitudes, it leads to a repetition of the avant-garde; and on the other, through the experience of so-called Cultured Painting, it leads to a resumption of the courtly-academic language. It had already been said that behind the Transavantgarde there was the cold planning of Achille Bonito Oliva, exponent of the Neo-avantgarde, who intersects his events with those of Group 63, among whose ranks counts Renato Barilli, historian and art critic, who, again in the eighties of the last century, is a supporter and promulgator of the Novi-nuovi, another current that follows the same citationist positions typical of postmodernism, albeit more directed at Kitsch aspects of a pop imprint and, within which, aspects of fresh and traditional artistic currents can coexist. But Barilli is probably, at the same time, the strongest Italian supporter of that artistic historiography that wants Cezanne as the first of the post-impressionists and precursor of modern painting. Here we must remember how – in the previous paper entitled The process of abstraction in the contemporary age https://www.danilosantinelli.it/danilos-blog/2-il-processo-di-astrazione-nelleta-contemporanea/ – we had pointed out that some of the ambitions of Cezanne’s research were heirs to the formal ideality already pursued by the Renaissance on Hellenistic examples, ambitions later taken up by Cubist research. But this theoretical precedence over pictorial practice is not an original attitude of postmodernism, which, even in this aspect, proves to be citationist with respect to the avant-garde, and in particular with respect to Futurism theorized by Filippo Tommaso Marinetti before all his practical testimony. Marinetti, and with him the Futurists, were the offspring of the elitist decadent culture that fed on the contempt of the bourgeoisie: «The modernists thought they could intervene in society to improve it, they were willing to collaborate with economic and political power, they proclaimed socialist and humanitarian ideals of peace and international communion; instead, the futurists expressed a radical rejection of society, they severed all ties with bourgeois conventions, they rejected the ‘weaknesses’ of socialist and internationalist thought to exalt individualism, nationalism, war» (Bairati Eleonora – Finocchi Anna, op. cit. cit.). So, if on the one hand, as mentioned earlier, the modernist attitude ended up serving the interests of the ruling classes, Futurism accelerated this process even more. «In the political field, the position of the Futurists was rather confused, but perfectly in keeping with the times: they sometimes came from populist or even socialist cultural circles; they were also open to anarchist ideas and at the same time professed a fanatical warfare accompanied by contempt for the weak […]». (Bairati Eleonora – Finocchi Anna, op. cit.). A consonance, with our political-social topicality, far from surprising, at least from the point of view of historical descent, thus reuniting with postmodernism, which cites it and, like futurism, leads to a new annihilation, although this time of the imaginary, given that in the Information Age wars are no longer conducted on a geographical level but on the media-informative-cultural level. After all, the avant-gardes, precisely because of their martial definition, present themselves as destructive and advanced, an aspect that will place art, from here on, as a necessarily new and opposed subject, as if opposing equals valid, as if new equals quality. All the more so because with postmodernism we have seen absolutely retrograde currents become avant-garde, both in theoretical terms and in terms of workmanship. A problem linked to artistic information and already deeply examined by Antonio Del Guercio, in the midst of postmodern activity, in his text Storia dell’arte presente. We usually look at art history as a succession of new currents, one after the other. A vision of artistic events, this, far from reality, since, for example, while the Expressionists operate, there are artists who continue along paths closer to the language of Impressionism. Or that while Abstract Expressionism is making its way, other artists deepen the lines promoted by metaphysics or magical realism. The fact that we often dwell on a single stylistic line that is considered in vogue is a problem that can be traced back to the market and to journalistic information in the sector. Del Guercio, in fact, brought his reflections against this logic. This aspect is particularly important if we want to understand some artistic phenomena that would otherwise seem to have arisen from nothing, or that can be considered minority or even outdated, but that will later mark important artistic events. This way of understanding the processes of art is clearly reductive and aimed at a typical simplification of periodic information, more focused on the aspects of chronicle and taste of the single era in which it operates. The historian, on the other hand, has an absolute need to understand the complexity and the concomitance of events, leading them back to their historical and cultural context. For the same reasons, it is a trivialisation to link an artist to a single event in his artistic research: for this reason, Giacomo Balla’s most famous aspects – because they are considered to be the most advanced and therefore the most representative – are those linked to the Futurist experience, even if before and after it the artist has preceded and continued his pictorial career in different ways. These aspects are certainly more useful to the market prices of the individual pieces produced by an artist than to the understanding of his work and his research. This “portioning” of art, and of artistic lives, is perfectly in line with the cultural reduction carried out by postmodernism: on the one hand it weakens the dissent of artistic research with respect to the imposed models and on the other hand it diminishes the complexity and the capacity of understanding on the part of enthusiasts and not only. The same attention to the pictorial matter and its use, however paradoxical, is often treated with superficiality, paying more attention to the conceptual reasons that would be behind the work of the authors, when it is precisely that matter to give them voice to those aspects and to reveal the thought of the painter. In this case too, the reference to the conceptual structure leads us once again to abstraction, to the prevalence of abstract thought over the material that embodied it. This specification is particularly useful, as this new “feeling” from outdated and minority events has been nourished. It makes use of a pictorial matter that has its roots in nineteenth-century production, where that same matter, decomposed and liquefied, becomes evident and the protagonist, but that comes from afar even though it has always been in second order to the polished classical tradition. The smoothness typical of the production of central Italy, which on the drawing, on the volume, on the idealistic-mathematical module typical of the perspective conception, sees in Piero della Francesca one of its greatest interpreters, although certainly not the best known: Michelangelo and Raphael are the protagonists universally known. The drawing clearly outlines the regular forms, making the figures vigorous in their geometric volume, the luminosity and chromatic vivacity and its careful and homogeneous application – which hides itself and the pictorial artifice – gives the complex a calm tone that pushes and exalts the formal aspects. While this pictorial tòpos – which in Hellenic art has its roots in the statuary in particular, then poured into Roman art – in the Renaissance knows its greatest exaltation, establishing itself with increasing force in the common imagination, other pictorial-material experiences come forward: On the one hand, there is the emergence of a painting in the Venetian area more marked by the exaltation of the same material and the chromatic construction of the painting, which will have in the last production of Titian (Supplizio di Marsia 1575-76, Pietà 1576) – when the career of the painter is now declining – the precursor; and, on the other hand, following Leonardo’s move to the Lombard area, a path was begun that was more marked by softness, which tended to crumble the volumes both by means of the atmospheric presence, giving the painting an aspect of soft fog, and by means of an interpenetration of the shadows of the landscape with those of the figures, where the chromatic structure of the painting became richer in browns, dark and mysterious. The fact that Titian pushes painting in that direction when he is now considered outdated, having now appeared on the scene younger painters, and thus feeling his hands free, is evidence of the minority of these experiences. The same is true of the fact that Leonardo, because of his pictorial taste, was forced to take refuge first in Milan and then in France. The story of Rembrandt, although more dramatic, is similar to that of Titian, he too, in fact, once out of the limelight will push more and more the matter to its decomposed emergence. In his last work (The conspiracy of Giulio Civile, 1661-1662), which was rejected by the client and of which only a fragment remains, he touches pre-nineteenth century peaks. 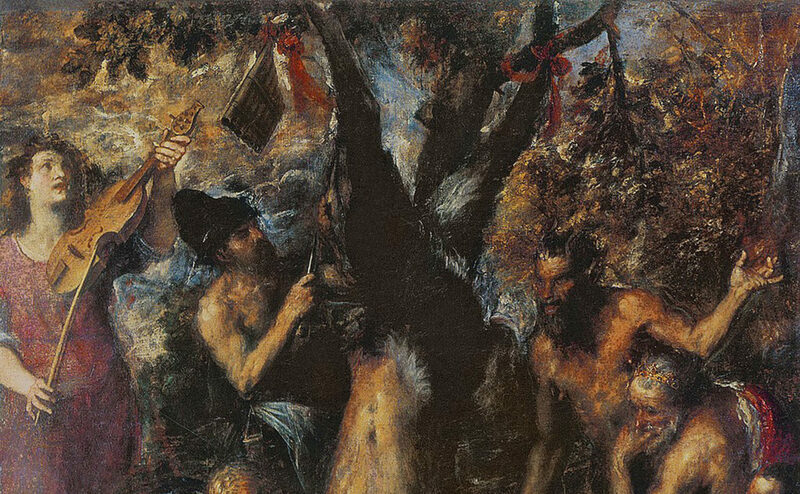 The mannerists of Leonardo’s area will continue on the path of the dark beaten by flashes of light that will explode, then, in the Caravaggio experience; Tintoretto in Venice, who had in the meantime supplanted Titian’s protagonism, will also transport the dark Lombard colours into the loose Venetian chromaticity, so that this greater dark and doubtful presence – in spite of the firm and certain painting of central Italy and interpreter of human protagonism – will make its way to Goya, that in its last period, now disenchanted, will tend to accentuate the dark and to make the material deflagration, constituting a precious seed for the following nineteenth-century painting. It is no coincidence that, in both the Veneto and Lombardy areas, the landscape became increasingly important, attenuating the leading role played by the figure and subsequently leading to the birth of genre and therefore landscape painting, a phenomenon that spanned the seventeenth and eighteenth centuries up to the landscape painting typical of Romanticism. Certainly, even in landscape painting, opposing souls coexist: that is, on the one hand there is a painting of classical origin – where the term classical means precisely the Hellenic, Roman and then Renaissance models of central Italy – which maintains the solid volumes and a clear chromaticity, then taken from neoclassicism in the so-called picturesque, on the other hand a darker painting, more loose, where nature is less comforting and arcadic and that, again in neoclassicism, will arrive at the so-called sublime. In Venice itself, with the advent of eighteenth-century vedutism, these two souls became evident in the production of two almost contemporary painters, opposing interpreters of the same landscape subjects: the views of Canaletto (Giovanni Antonio Canal known as Canaletto 1697-1768) are clear and firm, self-confident, those of Francesco Guardi (Francesco Lazzaro Guardi 1712-1793) darker and stormy, nourished by a loose and fragmented material, needless to say that the latter found much less favor. But certainly in what would later become the typical landscape painting, between the end of the eighteenth century and the beginning of the nineteenth through the research of Constable (John Constable 1776-1837) and Turner (Joseph Mallord William Turner 1775-1851), and without whose experience one would never have reached Impressionism, the material peculiarities typical of Guardi’s work are to be considered more present. This more decomposed use of matter seems to be indissolubly linked to that doubtfulness that gradually comes forward, precisely because in its decomposed evidence embodies it, turning downwards, to a human feeling rather than idealistic, interpreter of subjects also low. This material feeling, as you can see, is already the omen of a social feeling that will become typical of the nineteenth century with its socialist demands for emancipation. This certainly does not mean that the idealistic thrusts, opposed to it, were not present in the meantime, both in Neoclassicism before and after in Romanticism, expressed above all in historical painting. These were then taken up by modernism with Art Nouveau, and its various declinations, and by symbolism with the Preraffaeilliti. This presence remained constant, albeit disorderly and with different results, even throughout the twentieth century, both in the artistic current “Novecento”, in an attempt to be the interpreter of a national painting that intercepted the favors of the then fascist government, both, as they said, with the Metaphysical and Magic Realism. Nor were they absent from certain positions of the historical avant-gardes in their estrangement “from below” – which was instead typical of nineteenth-century representations – and which would lead to an abstraction of art, and of the artists themselves, from social dialogue, to lead them to a language that became increasingly self-referential and that the market and the establishment would know how to lead to their aims. The postmodern drift has already been discussed at length. Sure, mine can be read as a mere conjecture, but I am firmly convinced that the different use of matter, by artists, reveals the feeling of the ages more than is often thought. The nature of the various materials or non-materials used is, in my opinion, a practical testimony of the era in which they are used and an excellent vehicle for understanding the deepest moods. There is no doubt, however, that this fragmented and liquefied material marks many of the artistic events of the nineteenth century in an evident way: permeating the landscapes of Romanticism, the experience of French Realism, Italian Macchiaioli, Impressionists, up to the experiences of more isolated artists, given that between the end of the nineteenth century and the course of the twentieth century this material, which has become again a minority, will be the prerogative of individual and sometimes isolated artistic events. The experiences of Van Gogh, Munch and Ensor are a clear testimony to this, painters often isolated from the official circuits. At the end of the 19th century, the Nabis and the Fauves were an important part of post-impressionism, in which the fragmented and liquefied material certainly survived, albeit in a mixture with the decorative stylization typical of modernism. In the Nabis, moreover, there are also profound symbolist influences of a mystical-decadentist nature. Both these experiences, also for chronological reasons, prove to be similar and constitutive of decadent culture, the same positions taken by some of its exponents are proof of this. Clearly, each of these currents is made up of individual artists, who interact in a different way and according to their own sensitivity with the pictorial environments in which they participate, in the case of the Nabis, for example, Bonnard’s experience seems not entirely consistent with those characteristics. As well as, in the area of the Austrian Secession, Egon Schiele’s experience seems to deviate considerably from it, which is more evident in his landscapes than in his well-known nudes. The experiences of lesser-known painters of this generation should also not be ignored, as they became notable interpreters of that “material feel”, as in the case of Jack Butler Yeats (1871-1957), but which should be considered in the twentieth-century area, given that his pictorial career in that century took place. In the course of the twentieth century, that doubtful and disjointed matter became the interpreter of an identity of individuals by now in crisis – even after the First World War and the rise of totalitarianism – through the contribution of some artists, the first of whom was Alberto Giacometti (1901-1966). After the surrealist experience that he abandoned, he returned to the so-called easel painting, in a completely personal search, isolated and detached from the processes then underway. Although his sculptural production is considerably better known, it is in the painting that those pictorial-nineteenth-century reminiscences become more evident. In Giacometti the painting not only consists of a scratched and suffered material, but is in no way finished, it is the impossibility of grasping the living subject that forces him to interrupt and to a denied identity. The latter is a constant and fundamental aspect of these twentieth-century authors and of that new pictorial feel which, from the mid-nineties of that century, will become intense until it deflagrates in the early 2000s., but of which we shall speak in the next and final intervention of this series. The same use of a pictorial matter that makes the subjects appear unstable is another constant that unites these authors. In Giacometti’s work, sign and colour are frenetic and dirty, insistent and nervous; his paintings have the typically dynamic flavour of a preparatory study, precisely because living subjects strive to portray. In this, the Swiss painter takes up the nineteenth-century process that leads to a decomposed and liquefied matter that speeds up the pictorial execution, so as to capture the subjects in their everyday life and, therefore, in their passing. In this sense Giacometti is much closer to those references of the nineteenth century than to the volumetric decomposition similar to Cubism, Cubo-Futurism and Futurism itself. His painting does not strive to be advanced, avant-garde, it reveals instead traditional, although the use of matter gives the pictorial structure a different and modern aspect. Its modernity is in having continued the material process of representation of the living. It is therefore clear that Giacometti’s painting once again tends towards the low, centred as it is on human investigation rather than on the self-referentiality of the artistic language. Francis Bacon (1909-1922) is the other famous interpreter of this atypical process, he also seems to be uncomfortably placed in the historical-artistic twentieth century. In the midst of the informal evolution, his decomposed figurativeness appears to be detached and distanced, a fact due to that artistic reading that proposes the events in a separate chronological alternation rather than as co-presences of different processes. Even in his painting the instability of the subjects and the absence of identity return, the material is liquefied, rapid, frantic and evanescent, enhanced by its emergence from the dark backgrounds of the paintings, almost reminiscent of Caravaggio but without its finiteness, because even in Bacon there is that feeling of preparatory study. It is no coincidence that L’Argan compared Bacon’s work with some war drawings by Henry Moore (1898-1986), precisely because of this greater affinity with preparatory studies. The war drawings and some works of another artist, always born in 1909, seem to us to have more similarities with Bacon’s work and with the characteristics outlined so far: it is the Slovenian Zoran Mǔsič (1909-2005), whose drawings made secretly in the prison camp in Dachau, where he was detained, have the drama of torn humanity typical of Bacon’s work. In the seventies Mǔsič, in the works of the series We are not the last, returns to this sketched and torn figure. Needless to say, both in Bacon and in Mǔsič, attention to the lowest aspects of the human being is crucial. The following year, in 1910, Eugène Leroy was born (1910-2000), his material masses are bursting, in some cases almost indistinguishable, the identity of the figures is swallowed up and mixed with the material of the background, the execution is violent, physical and powerful. In this sense, Leroy’s work appears to be an extremity of Impressionism, just as the work of Jack Butler Yeats (1871-1957), carried out mainly from the 1920s onwards, appears to be an extremisation of Expressionism. In his work, too, the material is bursting out in every aspect of the painting, but instead of being applied by lumps of colour as in Leroy, in his case it is liquefied and rapid and the figures take on a loose and decomposed appearance, the colours themselves are dirty and violent. In 1916 Elmer Bischoff (1916-1991) was born, the first of the American authors of this area, apparently a late expressionist, but many of the characteristics present in his painting will be found in subsequent American authors. Bischoff’s attention is more focused on the relationship between man and woman, with the same sense of loneliness and resignation already present in Hopper (Edward Hopper 1882-1967) and far from the American dream, but in Bischoff the matter is rapid, dirty and violent, here too everything is as if sketched, to amplify the negation of faces without physiognomic traits or suggested fragmentarily, or where the figures are often presented from behind. In Paul Wonner (1920-2008) the characteristics already present in Bischoff seem to be even more accentuated, there is greater insistence on placing the figures from behind and in their negation, the material becomes more munchian and loose, rather than expressionist, the chromatic aspect is more glacial to accentuate even more resignation and solitude. But certainly the pictorial complex put in place by the Americans is less dramatic than that of the Europeans, an aspect certainly due to a different historical path, which has seen the concentration of destruction and extermination in Europe. Despite this, in the paintings of these American authors, there is no trace of the optimism of American propaganda. Franco Francese (1920-1996) was the same age as Wonner, and in his work the figures from behind also appear, but his Italian nature emerges in the evocation of vanitas, expressed by a material that disfigures the bodies. Richard Diebenkorn (1922-1993) is the other American, accumulated by the same characteristics, to the two previous ones. But his research also includes a landscape production, introducing us to the other theme typical of this area: the absence expressed through large spaces (internal or external) that are empty and abandoned. Dibenkorn regularizes the chromatic areas, assigning to the aspect of the painting a more dilated temporality, an exhausting slowness that makes it emerge, together with solitude and absence, an infinite boredom. The following year Giuseppe Ajmone was born (1923-2005), in his painting figures and landscapes are elusive, the nudes and views, mainly rural, make the classic tone of the subjects collide with their evanescence, collision produced by the illusive-material aspect that refers to the passing of time. The research conducted by Leonardo Cremonini (1925-2010) and contemporary with that of Bacon, presents similarities with this, but also obvious differences. The use of structures, which seem to contain, is common to the two painters, but in Cremonini they tend towards greater geometrism, accompanied by a chromatic vivacity that is absent in Bacon. This regularized chromaticity, in some works, seems to bring it closer to some of the expressive traits of the already mentioned Dibenkorn, but the strident palette used by the Italian painter assigns to the pictorial structure a hallucinated and in some ways psychedelic aspect. The contrast between a liquid and dripping material, forced into regular forms, produces a continuous and dynamic struggle, which disorients the viewer’s gaze, where everything should be still, but nothing stops. Born the following year, Leon Kossoff (1926) paints with a lumpy, pasty matter that violates the figures, which appear to be crushed and deformed under the weight of the matter itself, a metaphor for something larger. In some works by Alberto Sughi (1928-2012) these characteristics return insistently and forcefully even though they do not characterize his entire production: think in particular of works by the tenor of Il vecchio, Sotto la doccia, just to mention two examples; in them the painting is more phantasmatic and liquefied, rich in reminiscences of Bacon. The research of the Polish artist Jacek Sienicki (1928-2000) is rich in reminiscences of Giacometti’s painting. Also from 1928 is the American Nathan Oliveira (1928-2010), whose research is almost exclusively based on the figure. His oils have an even more intense and evident study nature than the previous examples. In this sense, his watercolours are even more incisive, precisely because of the nature of this technique, which makes the decomposed liquefaction of the subjects even more evident. The German Frank Auerbach (1931) makes a brutal use of matter that brings him closer to the typical gestures of the informal, although his subjects are almost exclusively figures. In particular, he focuses on the brutalization of faces, disfiguring and decomposing them. In the work of Ruggero Savinio (1934), too, the aspects of absence of identity and matter decomposition return, but in his case they are often applied to subjects and compositional systems of classic-Italian memory. The production of the American Terry St. John (1934) is of clear Wonnerian descent, of which, in the end, it presents the same characteristics. Dan McCaw (1942), another American painter, who even seems to take up the elegant luministic ascendancies of Impressionism within a thick and full-bodied material. Labelled, like many others, generally as expressionist, but to which, as I see it, little or nothing belongs, far from the violent expressionist brutality, rich instead of a delicate luminism. The painting of Gianfranco Bonetti (1947), on the other hand, is devoid of delicacy. He combines sign and chromatic violence to give a tone of brutal unstoppability to the events portrayed. John Virtue (1947) adds chromatic absence to matter brutality, using only black, in stormy urban landscapes dominated by the chaos and darkness of the times. The Swede Örjan Wikström (1948) uses a liquid painting, rich in transparencies, where the bodies seem worn out by the light of the exterior or that invests them through windows. Finally, with David Fairbairn (1949) we find ourselves once again in a universe rich in references to Giacometti. The rapid and scratched sign, in some cases material, is that of the Swiss master. Certainly the list of authors outlined here is not intended to be exhaustive, it has no historical ambitions but suggestive, is a process of my personal research aimed at deepening some historical aspects of the pictorial peculiarities that I feel my own. In the next and final intervention of this series I will deal with the authors of this area born between the sixties and seventies of the twentieth century, which sees them grow numerically exponentially and whose activity is concentrated, above all, from the mid-nineties. The painters of this area have maintained the attention to that low of which it has been said, are more focused on the drama that have involved the human identity, expressing it through a matter that reconnects them to that path of social participation typical of the nineteenth century, placing them, as a result, in antithesis with much of the self-referential abstraction that marked the body of the twentieth century.